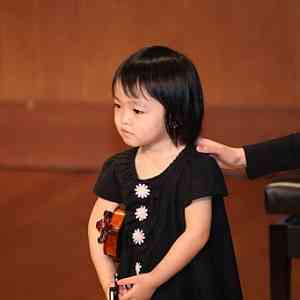 my 30 months old daughter keep lifting her chin from the chinrest when she does bowing and just look elsewhere. please help, how to make her stay focus? It is important to only give one task to focus on at the same time. The younger the child and/or the earlier the beginner, the more important that this task be extremely simple, almost ridiculously simple—because it can still be a big job for them. Give a very clear instruction, just one, and make sure she can follow it. You can break down each task into even smaller ones. For a not-even-3-year-old, this many steps can take a up a lot of practice time. But it’s important to master each step, no matter how small, before moving on to something more complicated. For the record, I’m not a violin teacher, but a piano teacher and violin parent. I believe that the Suzuki approach is the same regardless of instrument—so I just made up some steps I might use if it were my own child with the same problem at home. However, I humbly stand aside to allow any actual violin teachers out there to suggest more violin-appropriate steps! my daughter has a little improvement about the chin. i just need to keep reminding her everytime she lift her chin from the chinrest. now another issue, she is very upset when she bows and the bow goes all over the place, she refused to try. i just have to encouraged her , no matter how awful she play, any effort is better than nothing. 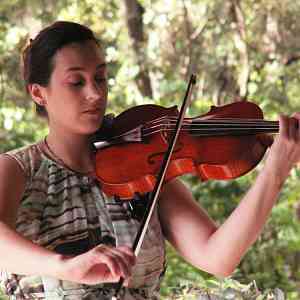 i need her to be willing to do the bowing practice,, then correct her the place for bowing, then the string.. but first, she has to overcome the fear.. of bowing..
Do you practice holding the instrument without the left hand? Have you (as a parent) practiced guiding someone else’s bow arm until you are able to do it confidently and securely for her? She can hold the instrument without left hand and count to 20. I’ve not guided anyone else’ bow arm but I did guide her for some time, but when I let go and let her do on her own, that’s the issue. She was like ‘i can’t do it, i just can’t ‘. I praise her for trying, even though the bow is all over the place or anything, any effort is better than nothing.